On the eve of the 88th birthday of late iconic singer Mohammed Rafi, Mumbai-based singer Shrikant Narayan performed a 12-hour marathon concert titled 'Pukarta Chala Hoon Main' rendering 101 immortal songs of Rafi Saab, paying rich tributes to the legend from 12 noon till 1:20am. What set me thinking post reading about this event is what inspired this achiever Shrikant to perform for over 12 hours nonstop. Many of us could only imagine what he endured to complete his 12-hour nonstop ordeal. Most of us may not even think or attempt of doing anything of this nature. On the contrary, individuals would rather prefer to sit in their own comfort zones. My curiosity levels increased and I decided to catch up with the singer himself for a brief interview over a cup of tea to which he readily agreed. Shrikant Narayan, a Kandivali-based resident, was born in a middle class family where having a good stable job was considered to be the utmost priority. He was more inclined towards playing cricket and wanted to become a cricketer. He used to commute from his residence to Worli Cricket Club in order to pursue his dream. Singing music was then just part of his life but never his passion. He used to listen and ape songs of Kishore Kumar. Chal Chal Chal Mere Haathi, O Mere Saathi was the one he started with. While he was a student at Bhavan's college, one of his friends recommended his name for a singing competition and ensured that he participated. Narayan gave the audition first and later got selected for the singing competition. The year was 1986-1987 and the song was "Tere Mere Sapne" that won him the first prize at the Intercollegiate singing competition. It was after this incident that Narayan decided to give singing his serious thought and the tone was set. In 1988-1989, he started pursuing music under the stewardship of Mohinderjeet Singh. He also started learning the importance of voice modulation from the renowned vocalist "Ananth Vaidyanathathan" who helped him understand how to maintain one's flow coupled with rise and fall in the pitch of one's voice. 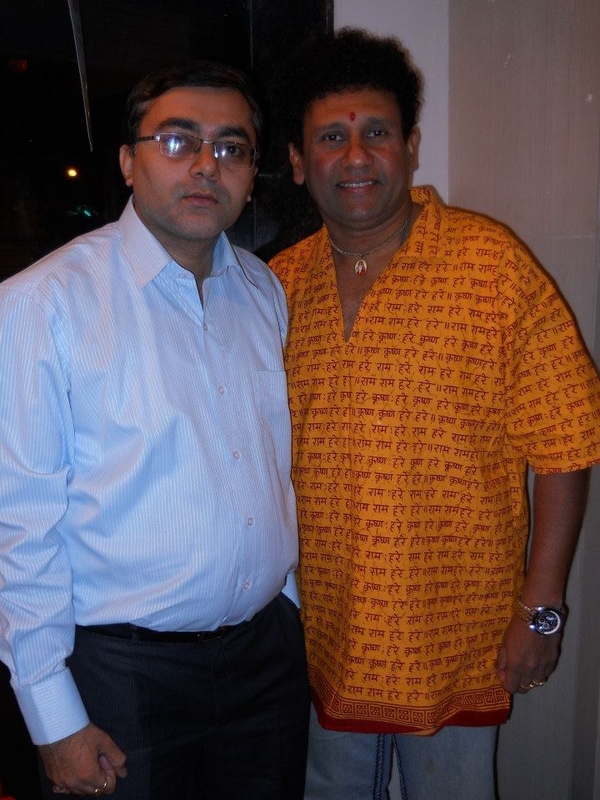 While Shrikant was in the final year of B.Sc., he was introduced by his friend Santosh Nayak to Venus Records as the right choice for singing Koli songs. To get the ascent and pronunciation right, Narayan rehearsed the same for full 10 days commuting daily from his home to Versova. The end result was some good toe tapping Koli dance numbers which included Dol Doltay Varyavar and Me Hay Koli which even today music lover's enjoy listening it. Break was highly instrumental for him setting the tone for recording future songs as it gave Narayan immense recognition. He won a "Double Platinum Disc". I was more interested to understand from Shrikant whether singing was an overnight journey for him or was it a voyage of discovery. The answer was the latter. After post graduation from Bhavan's College, his first job (1990-1991) was with "Film Center", where he worked as a "Computer Operator" for one year. "I consider myself lucky with the work exposure I got at Film Center as I could witness the live recordings of some of the legendary music composers like R D Burman or Kalyanji Anandji," admits Shrikant. His second job was relating to Pharma Sales and was associated with the company US Vitamins. His third job was again sales related with the pharmaceutical company named May and Baker where he worked for a period of over eight years. With the passage of time, music kept Narayan so busy that he had to keep juggling between his full time job and live music shows which at one point of time became relatively difficult for him. With careful consideration and due thought, he decided to quit his full time job now for getting full time into music. "With no job in hand there was a lot of resistance from the home on this decision taken by me," informs Narayan. Year 1997 witnessed the concept of stage shows and it was here Narayan started exploring and getting more opportunities in vintage songs by performing live music stage shows. “My parents were terribly upset post leaving the stable job. As I used to get back home late post coming back from the shows or recording I decided not to disturb my parents and opted to stay very near to my parent’s home. I used to then stay in one-room apartment and used to come home late post finishing my shows or recording. I used to just have a glass of milk and sleep. Those were the days of my struggle which lasted for a brief period of time which I could never forget,” informs Shrikant. Today, he is popularly known for the "Voice of Mohammed Rafi" and has been instrumental in creating his own unique identity, captivating the listeners with his melodious vocal chords. The year 2004 gave him the big break, admits Shrikant. A theme based show on Mohammed Rafi was created under the brand "Phir Rafi" by Prasad Mahadkar of Jeevan Gaani where he has been performing four shows every year back to back rendering songs of Rafi Saab. Today he has recorded more than thousand private songs in different languages in Hindi, Marathi, Tamil, Telugu, Kannada and Malyalam. He feels good in letting us know that Rafi Saab's family always attends his shows. Today, his parents who were initially apprehensive of his singing career now take pride in their son's very own achievements and they all want to come for all his shows. Apart from his family, his wife and children Narayan owe his success to organizers like Prasad Mahadkar of Jeevan Gani and Rajesh Subramanian of Musicolor for having the faith and confidence in him for performing stage shows. Narayan regrets that he could not meet Rafi Saab in person but yes the blessings of his family are always showered upon him. Shrikant has been awarded the Maharashtra Kalabhushan award by the Maharashtra government, and Jan parishad award by the Madhya Pradesh government. Double platinum Disc for his hit koli song 'Dol dolthai Varyaveri" by Venus records and tapes co. for the largest ever sold folk Marathi album. Today, he has performed in more than 900 stage shows all over India and abroad and has sung with popular artistes like Kavita Krishnamurthy, Shankar Mahadevan, Vinod Rathod and Sudesh Bhosle. Narayan also presents exclusive Mohammed Rafi shows where he performs with such ardour and diligence that he leaves his audience spellbound. Was Shrikant lucky in achieving the "Celebrity Status". The reality is Shrikant worked, planned and sacrificed for many years to get this status. In his early days, he committed his spare time in learning music which is now his full time profession. The efforts he put in across the years may be temporary but the satisfaction and rewards are long-lasting. Since I know him personally since '97 and have great respect for him,I feel sad that he mentions name of the pharmaceutical companies but doesn't even mention Keep Alive or Manohar's name.